We see LOTS of kidney stones in Sudbury. I’d swear that they mostly contain nickel and not calcium! About 5 years ago, I saw a 31-year-old patient with renal colic. I looked up their medical records on the computer. They had had 12 (!) CT scans in the previous 2 years. Can we do better? No one will question the accuracy of the CT scan in kidney stones. But do we need that tremendous accuracy each and every time? There is a growing body of literature suggesting that patients with possible renal colic can be managed without exposing them to radiation as we have done in the past. Here’s another article that supports an approach that includes bedside ultrasound. Riddell and his team (includes Stewart Swadron of EMRAP fame) published their study titled “Sensitivity of emergency bedside ultrasound to detect hydronephrosis in patients with computed tomography-proven stones” in the Western Journal of Emergency Medicine last month. – 125 of these had a bedside ultrasound. These patients were the subject of the study. – When combining ultrasound and hematuria, sensitivity for smaller stones was 89%, and 100% for stones 6 mm or larger. – did some bedside US not got documented? – less representation of patients who are tougher to scan? 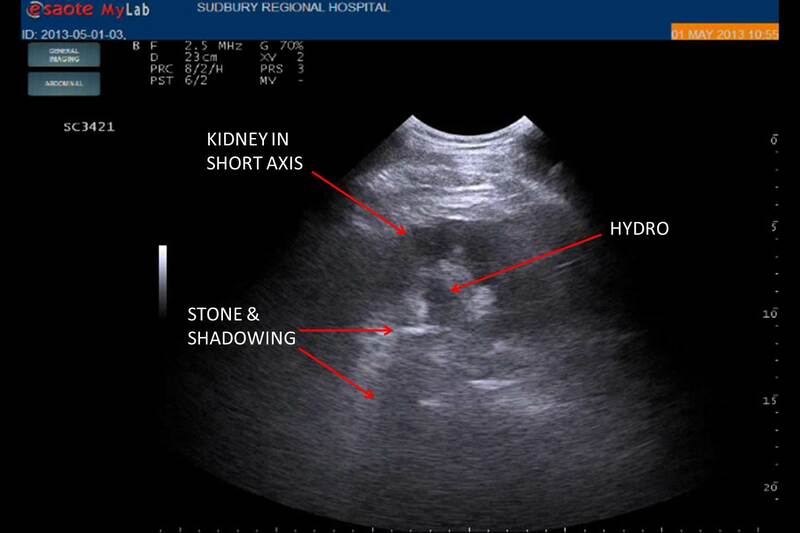 3) Renal POCUS/EDE 90% sensitive for stones > 5 mm, based on presence of hydro or the stone itself. Only 75% sensivity for smaller stones. 4) Don’t forget do look for stones in the UPJ. We focus a lot on hydro, but seeing stones will get you the Dx when hydro is absent as occurs in a significant minority. See the image for an example of a UPJ stone with hydro as seen in the short axis. We need a larger “n” and we need good prospective studies (which are being done, especially the multi-center STONE study which is done enrolling, so hopefully we will see date soon). But if we can do that, it may be possible to say that patients without hematuria AND without hydro on the ultrasound do not have a stone >5mm, which may obviate the need for further imaging (especially in young repeat stone offenders). I’m a rural physician, and until 2 years ago, I did not have access to a CT scanner in my community. I’ve managed renal colic just fine without it for 2 decades, although I’m of course aware of the risks of missing an AAA or other diagnosis. I’ve been using POCUS for this indication cautiously for several years with great success. In a patient who I suspect has renal colic, and in whom I then see hydronephrosis on my bedside scan, I’m usually done. Most of those patients require no further imaging. I can also use POCUS to rule out the AAA in patients who have risk factors for this. It is only the rare patient with renal colic or a renal colic mimic who will require further radiological investigations. I think this is safe practice, as POCUS is an adjunct to my clinical impression, and generally confirms my suspicions. I think this approach should become the standard of care in all hospitals, both urban and rural as it is clearly better for patients than repeated CTs. Hi from Aus. Very interested in your work because it has a lot of similarity with our own practices. Do you folk think there is any benefit in 1. comparing ureteric jets from each side (frequency of-) or 2. Colour to enhance twinkle artefact on small stones? Hi Kylie. Thanks for the comment! Not a great benefit from either so far in my practice. Ureteric jets are only useful if you see them. If you see jets, you can rule out complete obstruction on that side. But their absence cannot rule in complete obstruction. The reason being is that they are not that frequent. I can’t remember which study this data point is from. But it takes 4 minutes of scanning to see ureteric jets in 50% of normovolemic patients. And who has 4 minutes to scan a bladder in the ED?! In all honesty, partly because of my low yield so far, I have not been routinely scanning the bladder in renal colic patients. I mostly just scan their kidneys. Perhaps for that reason, I have yet to see a twinkle artifact consistent with the stone at the UVJ. I have looked. And I have seen twinkling. But these were false positives in patients who turned out not to have a stone at that location. Has anyone had better luck with either of these findings? I have to agree with Steve. Ureteral jets present=useful information, rules out complete obstruction. No jets=not helpful, could just take a few more minutes to show up. Not aware that frequency or flow characteristic comparisons between jets is helpful enough to make clinical decisions in differentiating partial obstruction. Radiologists I have talked to have confirmed that they don’t find the twinkle artifact too reliable either. I have had similar experience to Steve in seeing some false positives. I have had one true positive but it wasn’t easy or obvious to see. « How do you like your liver?